Attention tattoo artists - we are currently hiring at our Lower Greenville location (1902 Greenville Ave)! If you're an experienced artist with a solid clientele, we'd love to talk with you. We have positions for both walk-in and appointment only artists - flexible schedules and pay incentives. 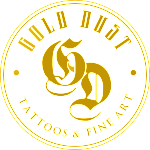 Gold Dust Tattoos is made up of strong and creative artists of varying styles. If this sounds like a good fit for you, contact Char & Emily via email - golddusttattoos@gmail.com.